Boil a cup of water. Add 1 tsp of Thai Black Tea. (You can either put the tea into a teabag to boil of you can add the tea into the water and filter out the tea leaves later). Leave the tea to boil for approximately 3-5 mins (or until the water turns dark orange in colour). After the tea is ready, transfer the tea from the pot and squeeze out the tea from the teabag or from the tea leaves while filtering. Add 2 tsp of sugar, 2 tsp of sweetened condensed milk and stir. Add 2 tsps of evaporated milk. Stir properly until they are well-mixed. At this point, the tea colour will turn light orange. 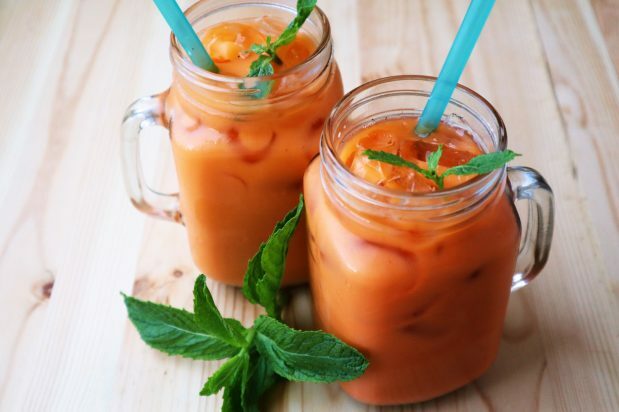 Fill the serving glass with crushed ice, add a straw and add the prepared Thai Milk Tea. Lastly, add some evaporated milk onto the top of the serving glass.